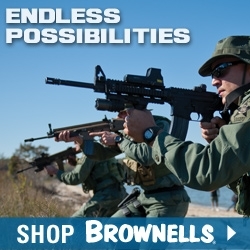 (ArmsVault.com) – The 10mm Witness P Match from EAA joins the ranks of “Perfect Packin’ Pistols” thanks to its power, accuracy and set of unique Tangfolio-inspired features. The new polymer-framed, locked-breech semi-auto graces the GUNS Magazine March cover, with a full report by contributing editor John Taffin. “Compact Thumper” reveals why Ruger’s Gunsite Scout rifle in .450 Bushmaster is a hunter’s handy, powerful tool. Tank Hoover took the bolt-action powerhouse afield and was quickly impressed by its potential and custom features. 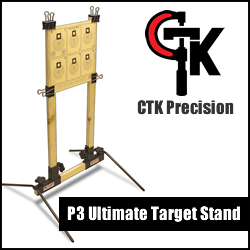 “My barrel was slick and shiny after shooting over 400 rounds of jacketed and powder coated bullets, with superb accuracy. Best of all, [the rifle] showed a penchant for stacking my cast bullet loads into tiny groups. Everything from rocks to rockchucks won’t be safe while on ‘walkabouts’ in the pasture, prairie, woods, or simply sitting in a tree, waiting for a deer or pig to stroll by,” he concludes. March coverage also includes a first look at Springfield Armory’s new SAINT Pistol — a direct-gas impingement pistol chambered in 5.56mm featuring a 7.5-inch barrel — in the “Out Of The Box” column. Readers will also learn about the growing popularity and acute skill needed for Extreme Long Range shooting in “Game On.” And John Barsness answers the question “Why The 6.5 Creedmoor?” in the issue’s “Handloading” installment. Customized by Majestic Arms, a Ruger Mark IV Target tops the March Gun Giveaway package. The 10-shot capacity stainless steel pistol in .22 LR has a 5.5-inch bull barrel; Majestic’s upgrades include an extended bolt and magazine release, walnut grips and an 11-degree target crown. The impressive package totaling $1,712.78 also includes a custom gun case from CaseCruzer, a CRKT folding knife called — appropriately — the Hollow Point +P from Ruger’s knife line and a Universal Gun Care Pack from Shooter’s Choice. 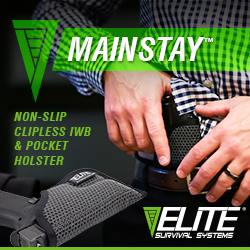 Readers are encouraged to enter for their chance to win by visiting www.gunsmagazine.com/giveaway. 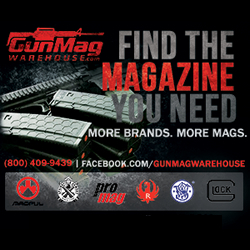 Exclusive content is just a click away in every issue of GUNS. This month’s Online Feature, “.22 Caliber Cross-Training” showcases how pistol skills can be learned easier and cheaper on a rimfire regimen. 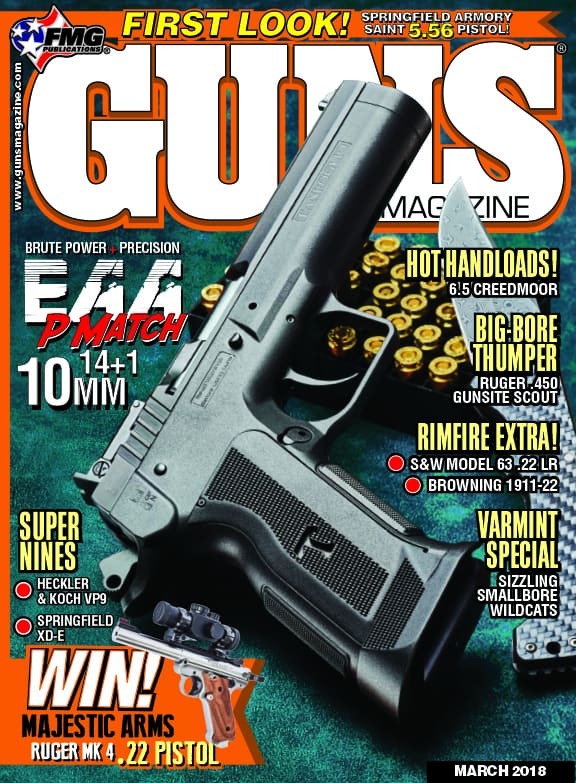 The March issue of GUNS is on newsstands now with a digital version available for purchase online at www.gunsmagazine.com/digital-version. 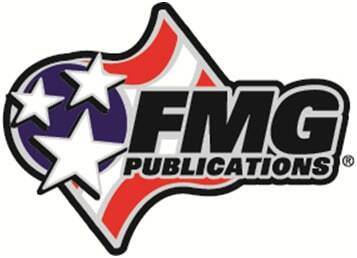 FMG Publications will be distributing free copies of this issue of GUNS — along with the March/April 2018 issue of American Handgunner and Shooting Industry’s Dec. 2017 and Jan. 2018 New Business Year editions — from booth #16327 at SHOT Show, January 23­–26 at the Sands Expo and Convention Center in Las Vegas.